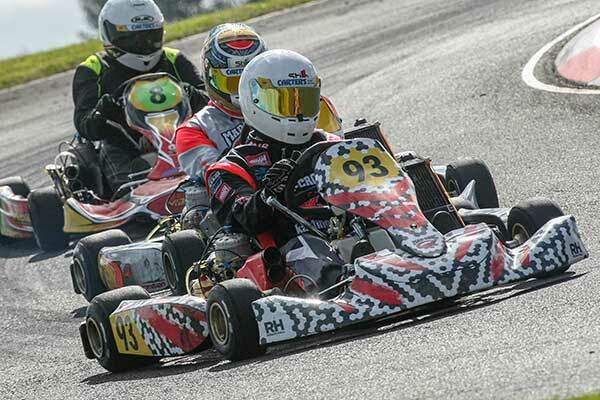 Former Junior class talent Matt Payne from Auckland stepped out of the shadow of the country’s top KZ2 class drivers at Tokoroa on Sunday, to claim two heat wins, a dominant pole-to-flag victory in the Lascom Motorsport KZ2 class Final and a debut series’ class round win at the second round of the 2018 Molecule ProKart Series. It was a masterful performance from the 16-year-old against the likes of recently crowned national class sprint champion Mat Kinsman – who qualified on pole, won the Pre-Final, and finished second to Payne in the Final – and international Daniel Bray, who won the inaugural class Top 10 Shootout, and finished third in the Final. Eventually coming good, meanwhile, after issues early on in the two-day event, were top female driver Madeline Stewart and 2017 NZ Open class champion Jacob Cranston. 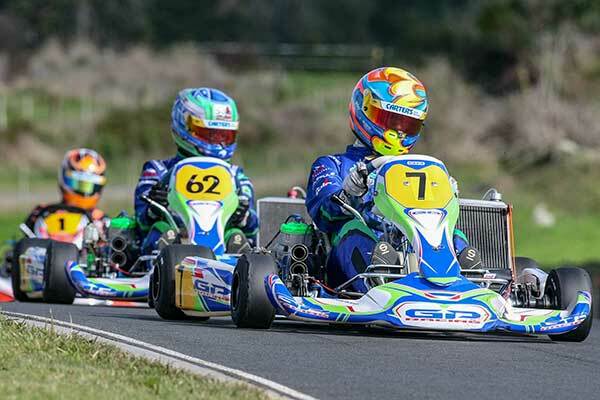 Cranston made it into the Top 10 Shootout, setting the sixth quickest time, but had chassis issues throughout the weekend, though the Palmerston North teen was still able to make up three spots form P11 to P8 in the Final. After blowing her race engine in practice on Friday Stewart has lucky fellow racer Daniel Bray had a spare she could buy, but unlucky that all her testing had been done on a dry track when it rained for qualifying on Saturday. Despite that she just missed out on a spot in the Top 10 Shootout, qualifying 11th, but moved forward in each heat (to P7 in the first, P4 in the second and P5 in the third) meaning she started the Pre-Final from P3. Unfortunately she had to take to the grass to avoid slow away pole man Matt Payne in that race, and on her way back through the field she crashed and failed to finish, meaning she started the Final from the back row of the grid. Undeterred, the Wellington-based international put her head down and made it back up to P4 at the chequered flag, enough to give her fifth place for the round behind Payne, Mat Kinsman, top local driver Brandon Lambert, and Hamilton ace Rhys Tinney. First round class winner Daniel Bray continues to lead the Lascom Motorsport KZ2 class points standings despite missing Saturday’s heat races because he was attending a friend’s wedding. Mat Kinsman is now second and Madeline Stewart and Matt Payne share third. There was a winning return, meanwhile, for former class title holder, Jared MacKenzie from Auckland, in the combined Lascom Motorsport KZ2 Masters/ KZ4 class races. After qualifying quickest, and also topping the KZ2 Masters class time sheets in the first ever class Top 10 Shootout, MacKenzie was unbeaten across all three KZ2 Masters heats as well as the Pre-Final and Final to claim the only clean-sweep of the weekend. Series promotor Steve Brown and fellow Aucklanders Andrew Hunt, Kevin Storr and Enrico van der Griend battled mightily over the minor placings in the Masters category with Brown eventually getting the better of fellow Aucklanders Hunt, Glen Ellis and Enrico van der Griend in the Final, though at no stage were any a real threat to MacKenzie. After a win at the opening series round and third – behind MacKenzie and Andrew Hunt – at Tokoroa, Steve Brown retains his class series’ points lead from Hunt and Enrico van der Griend. Finally, former class title holder Garry Cullum found himself with plenty of competition in Lascom Motorsport KZ4 for the second round in a row, but unfortunately ended up an early dnf in the Final thanks to a gearbox issue. Before that though he had only been headed by one other, Wellington ace Jamie Pollock – in qualifying and the Top 10 Shootout, and then Cullum had won two of the three class heats and the Pre-Final, the latter from Rnd 1 winner Regan Hall, Pollock and Gerhard Benadie. With Cullum sidelined it was Hall who won the Final from Pollock and Aaron Woolley from Hamilton. After a win at the opening series round at Palmerston North, Hall also retains his class series’ points lead over Cullum. Jamie Pollock and Gerhard Benadie. 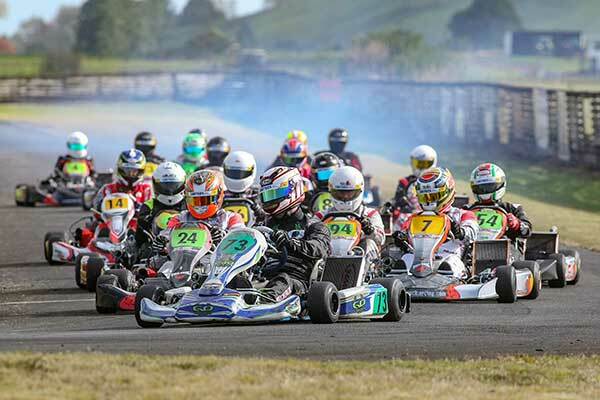 The Molecule ProKart Series again shares venues and round weekend dates with the Giltrap Group Rotax Max Challenge with the next rounds for each at KartSport Rotorua’s Century Batteries International Raceway over the May 19-20 weekend. 1. Matt Payne; 2. Mat Kinsman; 3. Brandon Lambert; 4. Rhys Tinney; 5. Madeline Stewart; 6. Jacob Cranston. Points after Rnd 2 of 5. 1. Jared MacKenzie; 2. Andrew Hunt; 3. Steve Brown; 4. Enrico van der Griend; 5. Brett Hollander; 6. Nick Isaac. 1. Regan Hall 183 points; 2. Garry Cullum 174; 3. Jamie Pollock 173; 4. Gerhard Benadie 171; 5. Aaron Wooley 167; 6=.Brendan Benadie & Shaun Curran 165.